The mid-1980s saw John Foxx’s musical style evolve yet again, but In Mysterious Ways turned out to be his last album for over a decade. 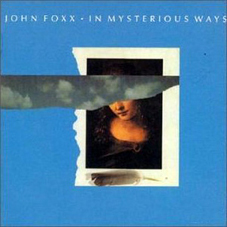 Released in 1985, In Mysterious Ways was a far cry from the sound and style that flourished on Foxx’s previous solo albums. Most of the song writing is typical to his lyrical style, but many tracks are let down by uninspired arrangements. The songs range from epic pop tracks such as "Stars on Fire", and "This Side of Paradise" to more downbeat, acoustic-led ballads. What is most distinctive about this album, are Foxx’s vocals. This could well be his finest performance as a vocalist – the songs are highly emotionally charged, proving to be a fine showcase for his vocal diversity. It is fair to say that In Mysterious Ways is well produced, although nowadays it does sound its age and typical of its time, unlike its two predecessors. Foxx was now blending in with the crowd from which he once stood out, and like many other artists from this period, simply became disillusioned by the music industry. The result of this is that In Mysterious Ways would be John Foxx's last album for over a decade. In Mysterious Ways was remastered and reissued in 2008, complete with a second disc containing several alternative versions of album tracks and three previously unreleased songs. These tracks - “To Be With You”, “And the Sky” and “Magic” differ significantly in style to the rest of the album, and may well be an indication as to the direction John Foxx was heading musically, before stepping out of the limelight. One interesting feature of this reissue, is Foxx's decision to replace the upbeat “This Side of Paradise” with a more fitting ballad, “Spin Away”, which was recorded at the time but not released. Perhaps a 20-year nagging in the back of the artist’s mind led to this decision, but now with the romantic “Spin Away” in position, there’s a sense of finality to this edition of In Mysterious Ways. Only two singles were issued from the album, detailed here.